Dude. I started racing in 2008 on a 1987 Univega with 7-speed downtube shifters on Kelly Take-Offs. The following year, I had a new race bike (S-Works E5), but when I moved down to Nashvile I was only able to take one bike for the first month and a half or so. Because I needed to do everything on that bike, I didn't take my race bike. 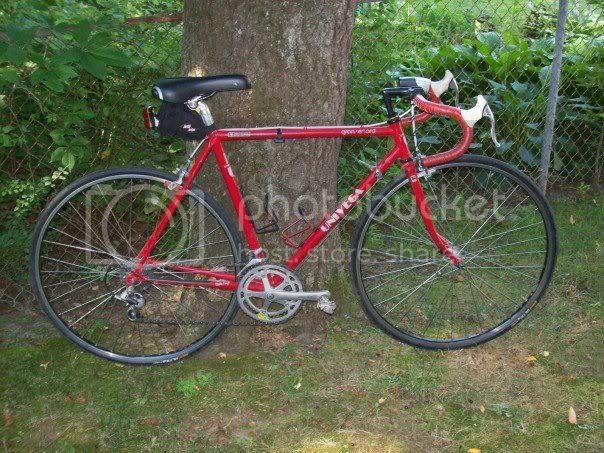 I took an '87 Schwinn Tempo with the original 6-speed downtube shifters. So I raced on that for a month. Step away from BF, head over to Bike Reg and register for a race already! My first few races I still had reflectors and a dork disk. truth is, no one is going to win a cat 5 race because of a fancy bike or gear. It just doesn't matter. One of my first races when I was starting up, the 3rd place finisher had regular shorts and t-shirt on a really cheap, heavy Schwinn Varsity type of bike. I don't think he even had clipless, just sneakers. He made a move, got a gap and held it. Good instincts. He came out with his family, had a great time. On the opposite end, another guy I rode with got caught up in all the tech hype. I gain X watts with tubulars, X watts with this, this many seconds, blah blah blah. He actually said, "I feel like I'm cheating with this advantage I have over everyone else." That changed once he raced. He DNF'd, and I think the reality put him off racing. Cat5 is about having fun, going out there and finding out what it's all about. Don't be gunshy and don't bury your nose in a computer. Crits are intervals. The best training are fast group rides and interval training. Plenty of rest before the race, and make sure you have fun. I bought my first bike off a man with a handlebar mustache named Hamish, the first time I rode it the world turned black and white and I started smoking hand rolled cigarettes. It was a vintage pre-war (WWI) Bruttomaiale, it was made out of wood. See back in them days you had 3 choices in equipment construction. The lowest was pig iron and only the Austro-Hungarians rode that junk but we could never figure out what their deal was, then there was Steel which was the latest fad in war waging and ships of the line but wasn't trusted by the minor imperial players (like Italy where my Bruttomaiale originated), and then there were the various types of wood which were tried and tested over the millenia. To save on rotational weight the wheels were constructed out balsa and the spokes were attached via horse glue, the frame itself was a sturdy lacquered oak naturally. The only drawback to the balsa wheels was that when you rode when it was raining they had a tendency to disintegrate underneath you, and that's how I broke my collar bone for the first time. Great race bike. Quite the opposite...we seek clarity. You do have a unique and endearing view of the world. +1 on all, and particularly the Bikereg suggestion! As for old bikes/equipment - local dude won a cat 2/3 crit here this season on downtube shifters (field sprint no less). Granted it was just in CA and not in the rust belt, but still! Pretty impressive. And goes to show that equipment doesn't matter as much as the legs - or brain for that matter. Of the three of you california pinballs, who has broken more bones in the past few years? Nice venue...250 meter wooden track with 45 degree banking. I raced masters track nationals there in 2010. Your numbers look fine. If there is a problem, it will be the ability to hit your 20s and 30s numbers over and over again on the track or in a crit as the peloton surges. I will address the track. It sounds like you have not been to the track before but I may be wrong. Check out the Superdrome's requirements for certification. Also, they offer skills clinics. I recommend a get ready to race clinic after certification. If you have already done this, you are good to go. At Hellyer in San Jose, we require 3 beginner Saturday sessions before mass start racing that equates to 9 hours of instruction. NorCal road racing has our Early Bird series that is a series of sessions with instructors for racers of all levels to work on skills. Plus we have instructors / coaches that run skills clinics throughout the season. I suspect Frisco and your local racing district has road skills clinics as well. IMO, skills come first then power then racing. Last edited by Hermes; 08-28-15 at 12:30 PM. If I do it this season, I'll definitely post about it here. I can already envision it. "Was in the back third, trying not to get in the wind. Got behind the wrong wheel, and gap opened up. Decided not to bridge. Gap got big and I realized these were the guys off the back permanently. Made huge effort to bridge. Gassed. Next acceleration came and I was off the back. Soft-pedaled and watched the race unfold." "Started off as fast as I could, landed in the back third after the first couple laps, then watched the field just ride away as I screamed at my legs to do more. Got lapped, then got pulled. Good times "
I have to say, the worst part of racing a 20 year-old bike, BY FAR, was the brakes. Good lord, the brakes. They were terrible. And these were Shimano SLRs, among the best single-pivot calipers ever made. Everything else, assuming you're comparing good-quality bikes, is marginal. Road bikes just haven't changed all that dramatically in the last 30 years. It's not my fault I keep getting run over after crashing! That's where the broken bones happen mostly..
too many followers I guess. I've never broken a bone on a bike. Lost plenty of skin, but no broken bones. I am more than 3 years beyond my last really-broken bone. Aaron crashes semi-monthy, and Matt has broken plenty of ribs the past 2 years. You just need to race more! raced sixty times in the last three years. crashed thrice in them three years. broken bones = 0. separated shoulder = 1. broken bike = 1. FYI to OP ... just race. Equipment won't matter. I raced my first race in 2013 on an old 2006 Felt alloy something or other against a bunch of guys on top end goods. It was fun. Be safe. Report back with the story. For one - weighting fore and aft. On a decent, the weight will be farther back. There are generally speed differences entering and exiting as well. Of course the approach is different. The descender is often braking before the corner throwing weight on the front. Yea I know the pavement was slippery but I doubt Lace would have been doing his cross country trip if Beloki didn't have a corner in front of him - on a decent. If the corner is also descending/negative grade, you have the exact same centripetal force (v^2/r) but less friction, as the weight on the tires is less so you cannot lean as hard as if the corner were level, for the same reason a sports car can break much shorter distances going up hill than down hill. you shift weight in a flat corner too. I feel in general you are really overestimating any difference. how much less weight is on the bike tires on corner on a smooth grade? Like 7%. I enjoyed that flashback in time and would like to say it was a fun read. However, you'll reply, 'Thanks' but since I'm on the west coast, the other east coasters will give you a hard time for being nice to a west coaster. Then I think, 'No...he's not like the other guys'. However, in every movie when someone isn't like the other guys, its because the other guys paid the dude and he's just a fraud. Of course then that person has a revelation and realizes west coasters are people too....but then again, that's the movies....so I'm torn. Well my personal experience telling me that to have fun racing you have to have some understanding of tactics (how not to panic in group, how to keep on right wheels and so - look at my topics I am struggling) OR better fitness than everybody else. 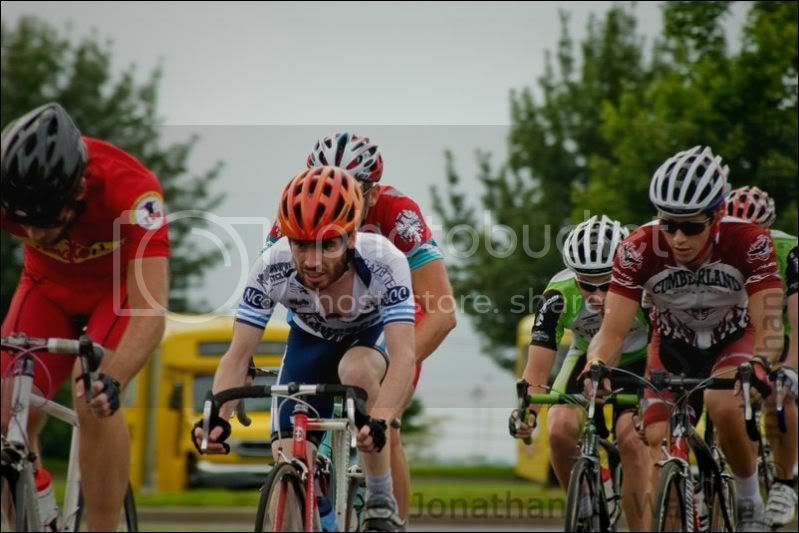 I have arguably better fitness than most of cat5 racers in races that I do so that make practicing those interesting for me (ie I do not get dropped most of the time). Find free practice criterium around where you live that helped me a lot. Update: I'm on a cycling team but really only know them electronically. Because they live kinda far from me (where I used to live on the other side of town). I finally went on a small Sat. morning group ride with them. And met a Cat 5 racer. he was really nice, gave me a lot of insight. He's a new racer with about 8 starts under his belt. He's built kind of like me. He weighs about 200lb (me 190lb). We were going through a few rollers and the guy in front of me dropped the hammer on the last hill. I held his wheel, but the cat 5 racer got dropped. Perversely, that gave me some encouragement. He said he just did a 13 min FTP test where he held 300 watts. I doubt I could do that. But strava just upgraded my estimated FTP to 229w, and my 1 second peak power is now over 1400w. So maybe it is reasonable for me to give it a go. Plus I might have teammates I can work for/with. I've also watched a couple of sprinter della casa's videos, so I've got the race tactics thing down in my head. Keep going on these rides when you can. Don't worry about power. In your current context it means nothing, really. You're not going to drag race 30 minutes, you'll be in a pack and can shelter. I can go out and race an hour crit and NP like 225 watts with a 150 avg. I'm 185-ish lbs. I race with guys that are putting out 275 avg watts at 150 lbs. What does that all mean? Nothing, just race (and dont look at your power numbers while racing). In any given field, people will be working at different levels and with selective placement, most can survive with crummy fitness.